The extreme and prolonged temperatures in the 90’s of the past few weeks have really tested the tenacity of all gardeners. We are finally getting some deep soaking rains after nearly a month of completely dry conditions. If your garden has suffered, you are not alone. What can you do to protect your garden against these extremes in the future? 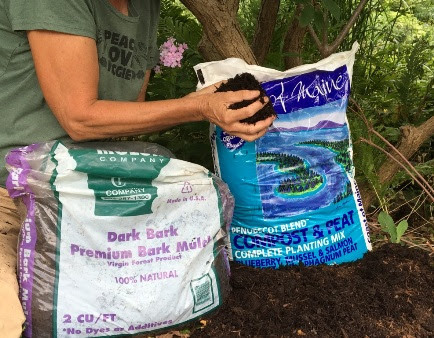 The first thing is to add plenty of organic matter to your soil in the form of compost. For shrubs, we recommend Coast of Maine Penobscot blend. Shrubs growing under trees are even more in needed of compost, as the tree roots can be very greedy. Then, deep soak your shrubs, leaving a hose at a low stream for about 15 minutes. Then, topdress with mulch, making sure that it is 2″ deep. We just got in some rich, organic premium Dark Bark mulch that would be perfect. Mulching after watering (or rain) helps keep the water in the soil. If your soil isn’t mulched, water is lost to evaporation as sun and wind hits the surface of the soil. NEVER leave your soil bare! You can bring home a few bags of mulch at a time and gradually your garden will be SO much happier. Compost enriches the soil and helps it retain moisture. A thick topdressing of mulch keeps the water in the root zone. It’s Be Kind to Your Trees and Shrubs Month! We are firm believers in foliar feeding our gardens (and the plants on our benches and in all of our containers) with liquid seaweed in August. Jen and other members of my gardening crews take it a step further and foliar feed with Organic Plant Magic, a compost tea that has seaweed in it. Both of these organic sprays help the plants be much more resistant to heat, humidity, and drought. We do it at the garden center and you can truly see the difference in the health of our plants.